​Who should read this book? Do you know of someone that has been diagnosed with ASD (Autism Spectrum Disorder)? Are you a parent, a teacher, a family member, or, a caregiver of a child that has been diagnosed with autism? Do you want to learn about self-care for yourself? Do you want to know what it is like for a family that has at least one family member living with autism? If you answer yes to at least one of the above questions, this book is for you. It promises to give you another insight on how to care for an autistic child. It talks about the challenges and the rewards of having a child along the autism spectrum. It Provides tips for self-care for the parents as well as the caregiver and the autistic individual. In my opinion everyone could benefit from reading this book. The book provides another perspective of parenting a child along the Autism Spectrum Disorder. It shows you why you were chosen to care for this child and how to turn challenges into rewards. It will also help you to create a balance in your family life. The book will also show you how to take care of yourself in the process while caring for your loved ones to prevent burnout. It is my hope, that as you turn the pages you will experience joy, love and happiness while caring for your ASD child despite the challenges you may face on a daily basis. Be blessed. WOW!….Reading this book, I understand so much more about the whole disorder of autism. And as a person living in this world, just living we will all most likely come across someone, somewhere that is autistic- just looking at the statistics in the book and how this had grown in numbers over the years……This book helps in knowing how to deal with those affected by this. All that parents have to go through with their children in general is a lot- but the special situations that need to be differently handled- who would have known! Also the fact that animals can have a great impact on the growth and development in an autistic persons life makes me think of training my dogs more to handle autistic situations they come across. WOW!…….Winnifred really put herself into this book and shared her experiences well, I totally recommend this for anyone actually- I think all people need to be able to communicate with ALL people out there not just one or two people of their choosing- and people need to know what to do in all situations! Have you felt confused or frustrated about the diagnosis of ASD/PDD? Or have you felt alone, went into self-denial, or experienced other emotions regarding such a diagnosis? Mrs. Walcott discribes in her book their own family’s story and how she finally managed to turn the tide around. She explains autism and what such a diagnosis means for the child and the family. In addition, she provides guidelines and a helping hand on how one best cares for an autistic child without forgetting the much needed self-care for the care-giver. I will definitely recommend this book to my clients who deal with this diagnosis. The autism diagnosis has spiraled upwards in recent years. Winnie Walcott has written a book on Autism from the heart. Only a mother could write such a book. When you receve a diagnosis of Autism, it shakes your world up and navigating your way requires courage and focus. 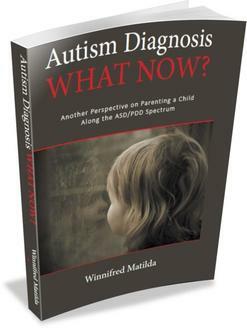 Winnie Walcott has written a book that gives you a great road map that will give you insight into the confusing world of autism. This is great read for anyone who is needing guidance and direction into the world of autism. I highly recommend it! extremely well written book. a topic many parents struggle with as they may find their child is autistic. this book is a great guide to helping parents follow alternative ways to help their loved one through this diagnosis. As a parent of an autistic child, Ms Walcott shares her vast personal experience to help other families facing the same diagnosis, in an upbeat and practical way.